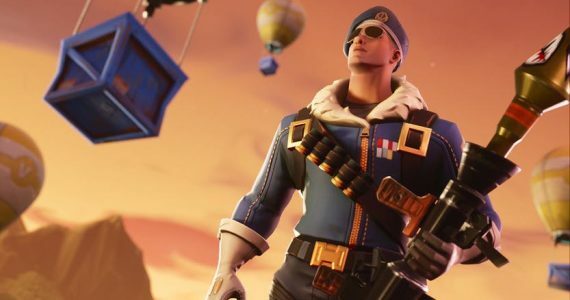 When it comes to choosing the right gaming laptop, gamers and PC enthusiasts often face a common dilemma: whether or not to sacrifice mobility for high-end performance. Most of the time – for users who travel a lot – a notebook’s weight becomes the most important factor. Bulky and heavy laptops are usually not an option. 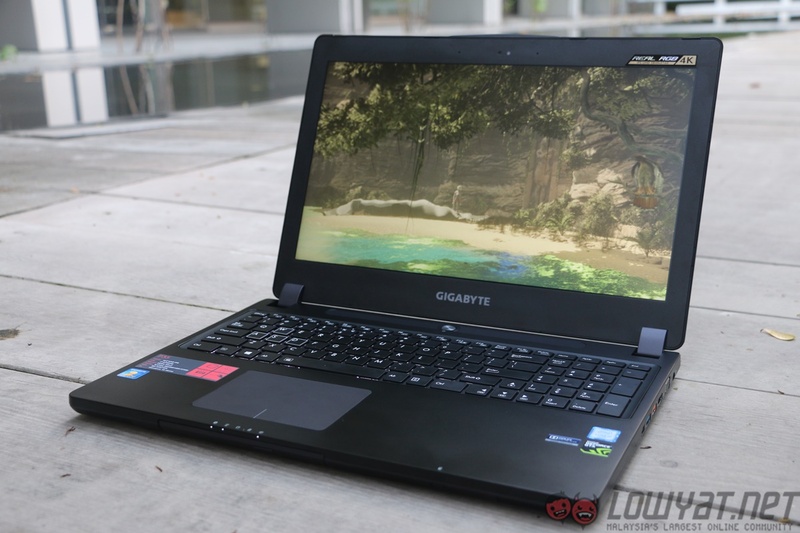 Cue Gigabyte and its brand new gaming laptop called the P35X v5. 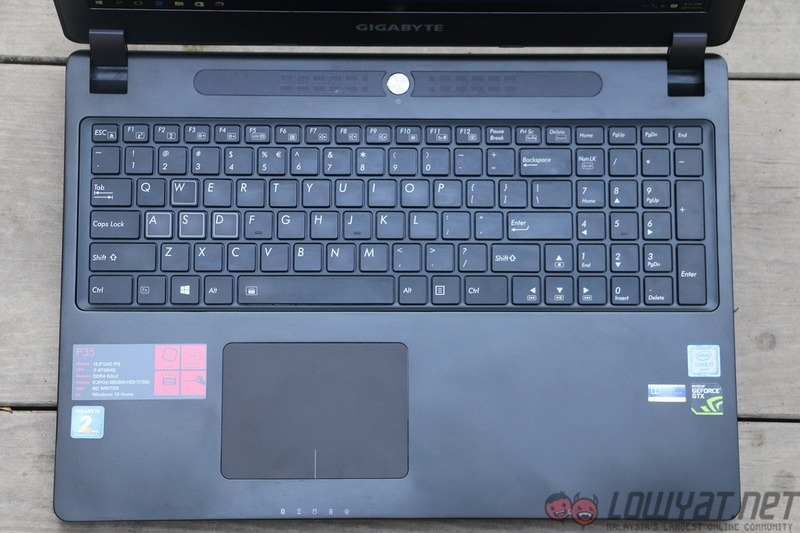 This slim, 15.6-inch gaming laptop comes with several neat features that may be beneficial for gamers who are often on the go. Be warned, however: this laptop isn’t friendly to the wallet at all. It’s priced from RM8,999 up to over RM10,000 for the premium edition, which I will be reviewing. 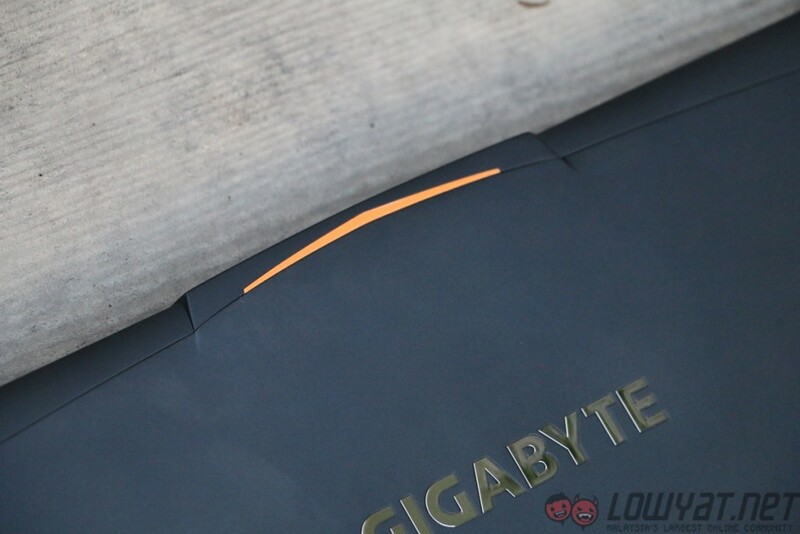 Let’s take a closer look at Gigabyte’s latest offering. Disclaimer: Our review unit is the “premium edition” model, which comes with a 4K display. The version available for the Malaysian market is the Full HD model, with a choice of either a GTX 970M or GTX 980M GPUs. 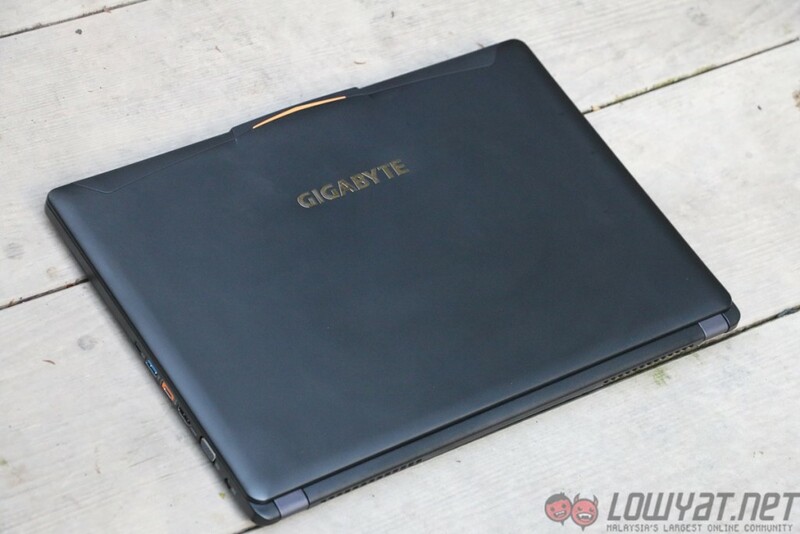 Design-wise, the P35X v5 follows previous Gigabyte laptop models, employing a minimalist look that may be mistaken for a “normal” laptop, except for the occasional flashes of orange around the chassis. 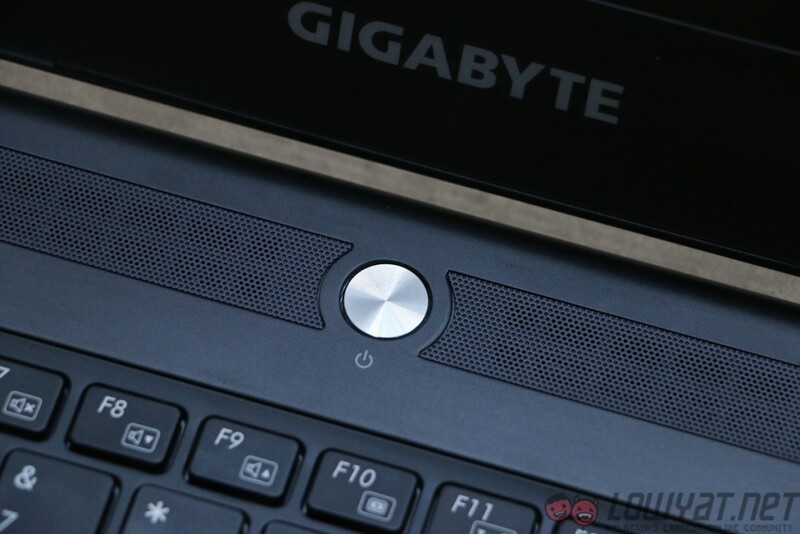 The P35X v5 features a unibody frame that is (according to Gigabyte) made out of a single piece of metal. 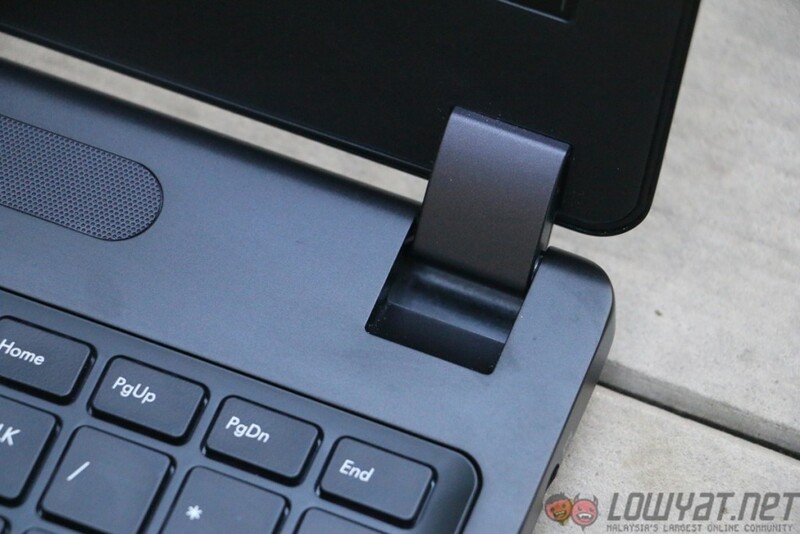 Of course, there are plastic bits and pieces embedded around the gaming laptop as well. Out of the box, the P35X v5 feels solid and surprisingly light. In fact, it’s the lightest 15-inch gaming laptop I’ve ever encountered. 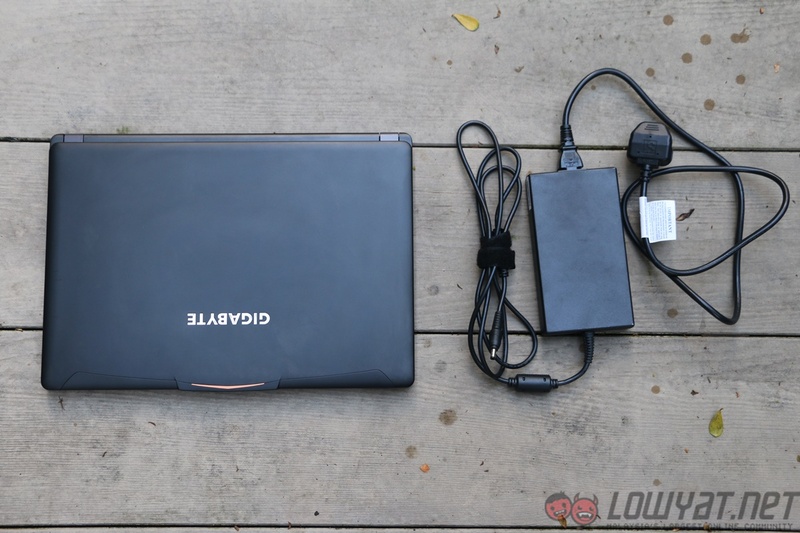 When compared against a similar-sized laptop like the Illegear Z5, the weight difference is very noticeable. The minimalistic feel continues within the laptop. The keyboard keys are printed in white, and has a white backlight with only two levels of brightness. 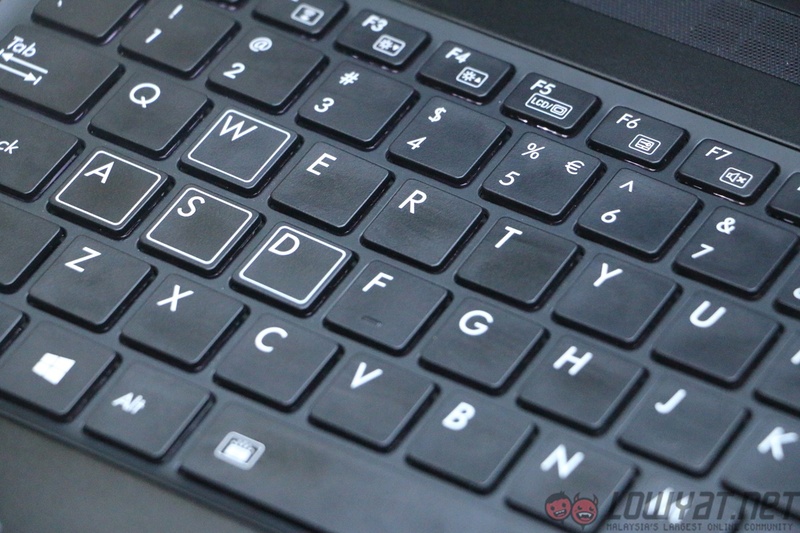 It’s almost like a generic laptop keyboard, except with highlighted WASD keys. 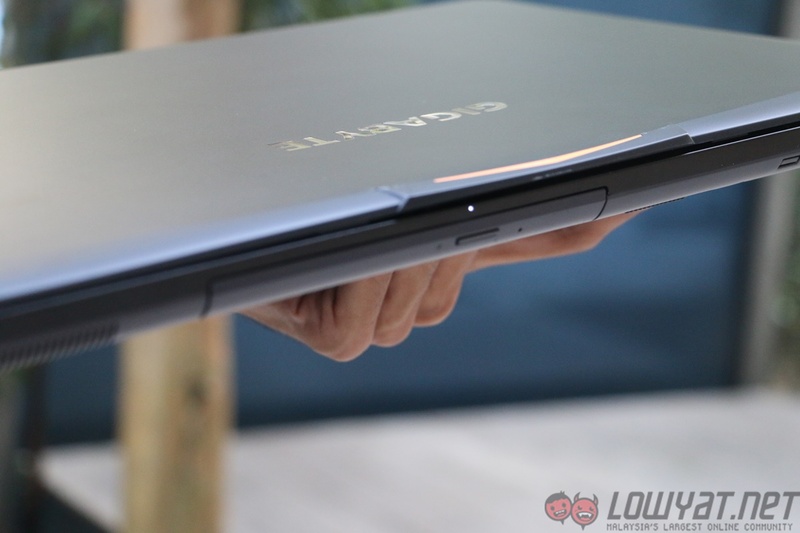 It’s also the kind of design that one would find in a laptop priced significantly lower than the P35X v5. 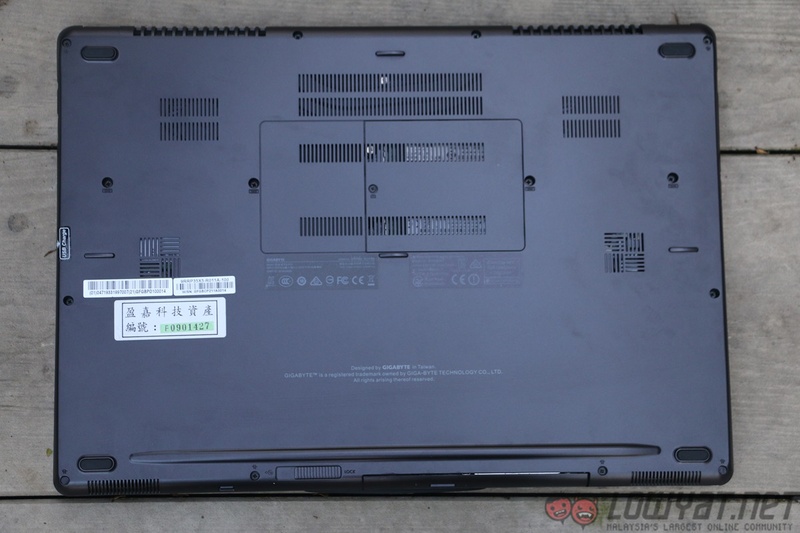 Despite being a 15.6-inch gaming laptop, the P35X v5 comes with plenty of I/O ports, which is rare to see in a laptop of such design and size. Located on the left of the gaming laptop are the microphone and headphone jacks, two USB 3.0 ports as well as an Ethernet port. 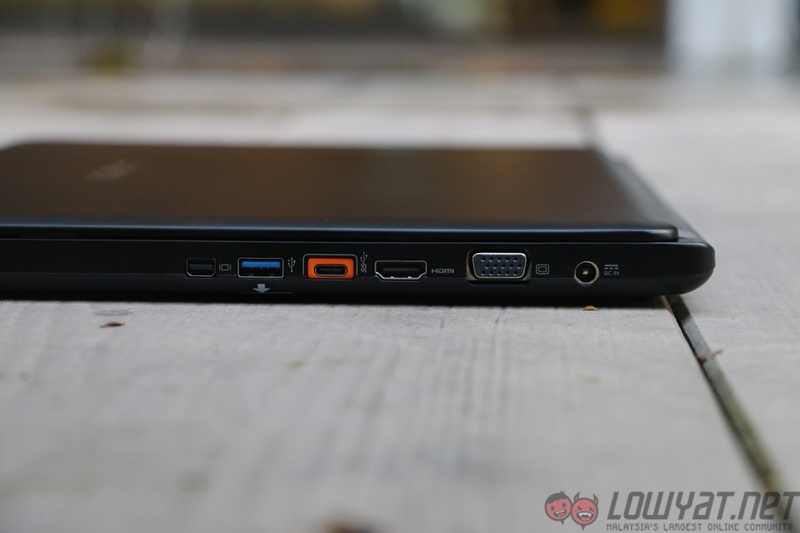 Meanwhile, you’ll find a USB Type-C, VGA, HDMI, USB 3.0 and AC charging port on the right side. Personally, I found the whole design rather underwhelming for a high-end gaming laptop, though it must be said that there are a handful of gamers and PC enthusiasts who prefer this kind of toned-down, less exuberant design. Fortunately, graphics performance is where the P35X v5 shines. This comes as no surprise really, considering the fact that the gaming laptop comes with a powerful dedicated graphics card. 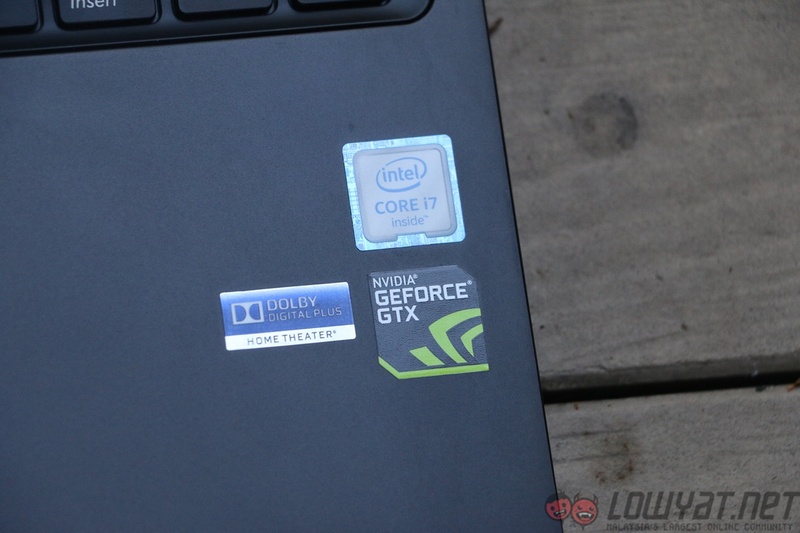 The NVIDIA GTX 980M inside the gaming laptop was put to test using 3DMark’s Fire Strike series of tests. The final results can be considered as outstanding. Not a lot of gaming laptops can achieve such high test scores when running Fire Strike. However, PCMark 8 benchmarks tell a different story. When benchmarking using the software, the P35X v5 surprisingly struggles when running Home, Work and Creative Conventional tests, only managing to score 2,831, 2,752 and 3,143 respectively. 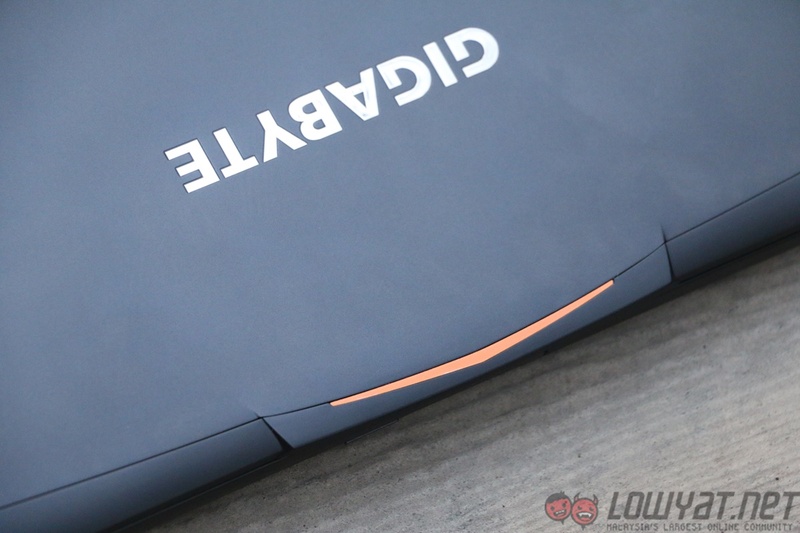 Even the recently reviewed MSI GS70 had better PCMark 8 scores compared to Gigabyte’s newest gaming laptop. One of the more impressive features of the Gigabyte P35X v5 would be the included Samsung SM951 NVMe M.2 SSD. Using the M.2 standard means that the SM951 SSD has higher read and write speeds compared to a traditional SSD. 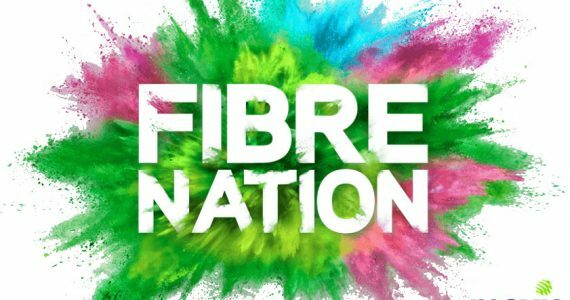 To be more specific, when transferring a 1GB (1.07374 GB) file, the sequential read and write speeds were recorded at an eye watering 2,195MB/s and 1,268 MB/s respectively. The 1TB HGST Travelstar HDD however, isn’t as powerful; but one wouldn’t expect much from a standard HDD anyway. The read and write speeds of the HDD when transferring a 1GB file is 133.2MB/s and 126.3MB/s respectively. Despite this, a 1TB HDD coupled with a fast and efficient M.2 NVMe SSD is still relatively a good combination. Unsurprisingly, 1080p gaming was a breeze for the P35X v5 – this is a really expensive gaming laptop. 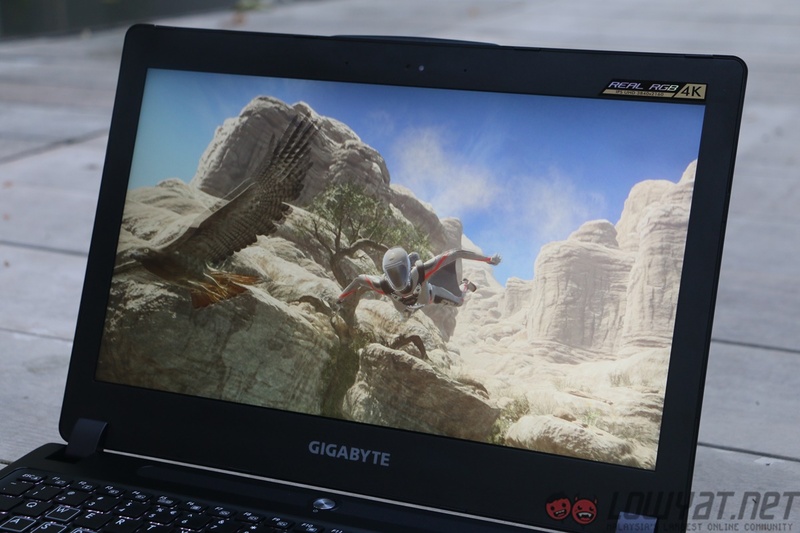 Every single game tested on the gaming laptop produced frame rates above 30fps. 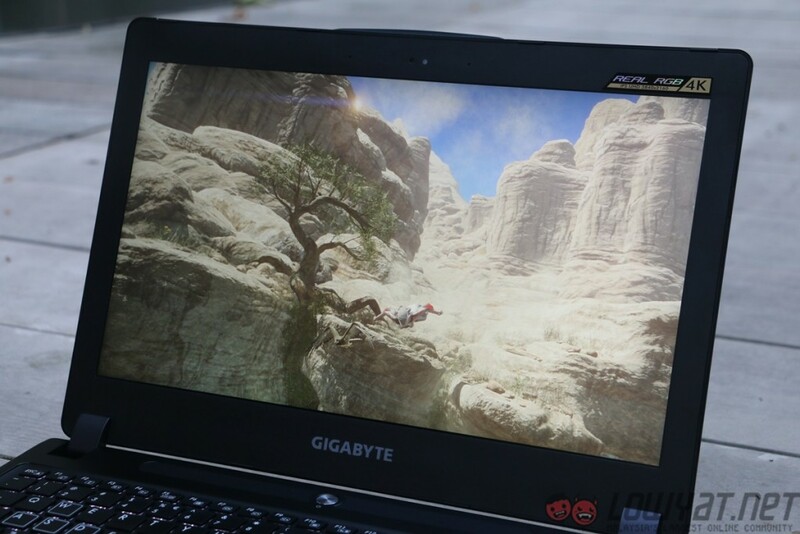 Impressive, yes, but 1080p gaming isn’t what this laptop was made for. Fortunately, 4K gaming on the P35X v5 is somewhat possible. It must be said that to achieve acceptable frame rates in 4K, one has to opt for medium to high settings instead. 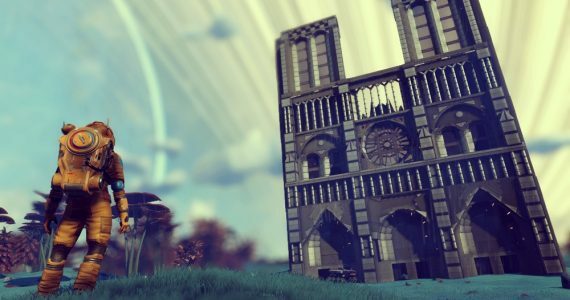 Ultra settings often produce unplayable frame rates. Speaking of which, don’t bother running Crysis 3 on 4K with the P35X v5, you’d be hard-pressed to know that the highest achievable frame rate was 21fps. 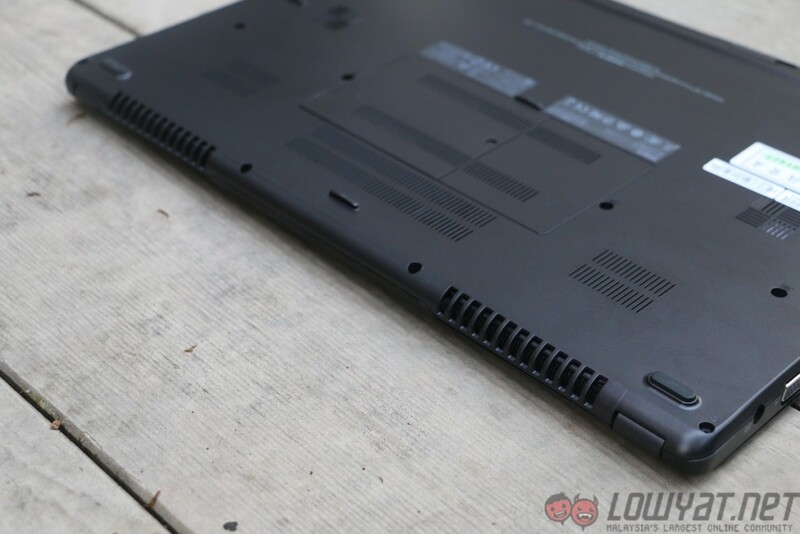 Despite being a gaming laptop, the P35X v5 is equipped with an efficient battery. The on-board battery managed to power the laptop for about 3 hours when running the PCMark 8 Home Conventional battery test. Meanwhile, when benchmarking using the Sky Diver Demo loop, the laptop lasted for about 1 hour 16 minutes. For a gaming laptop, this is quite impressive. When compared against the recently reviewed MSI GS70, the battery life on the P35X v5 surpasses it by quite a distance. It’s also worth mentioning that the battery on the P35X v5 is built in, which means that it cannot be easily removed and replaced. The pièce de résistance of the P35X v5 is undeniably the IPS 4K display. The P35X v5 gaming laptop comes in two variations, one with an IPS 4K display and another with a full HD display. Looking at the laptop’s display when watching a 4K video was breathtaking. The amount of detail shown on the display was unlike anything I’ve ever seen on a laptop before. The same however, cannot be said about the keyboard. 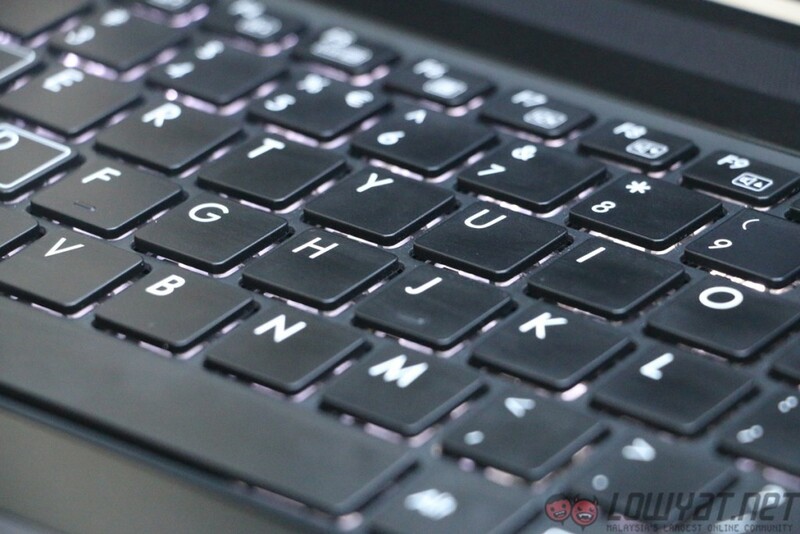 The backlighting on the P35X v5 keyboard is single coloured (white) with two brightness level adjustment. 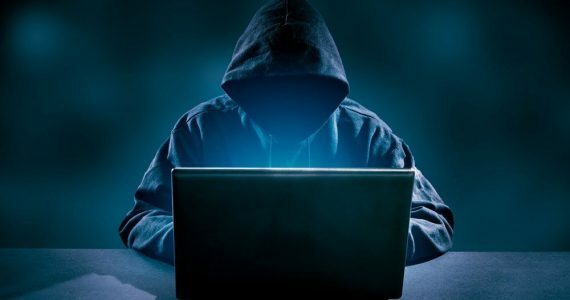 Ironically, the keyboard’s backlighting can barely be seen in a well-lit room. In addition to that, the key travel of the gaming laptop’s keyboard is very shallow, which makes typing very unsatisfactory. It doesn’t help, either, that Gigabyte chose to put the arrow keys so close together with the alphanumeric numpad section of the keyboard. While gaming and running benchmarks on the P35X v5, I noticed that when the laptop’s GPU temperature reaches 75 degrees Celcius, the fan noise became noticeably loud. 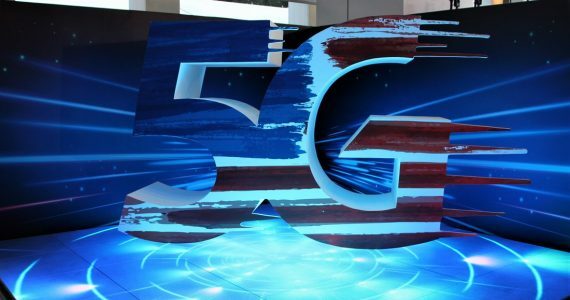 Interestingly, the maximum temperature of the dGPU was recorded at 75 degrees Celcius, which may indicate an efficient, but noisy cooling solution. Despite this, the heat output may prove to be an issue when gaming for long hours. Certain parts of the keyboard became increasingly warm up to a point where it was a distraction at times. 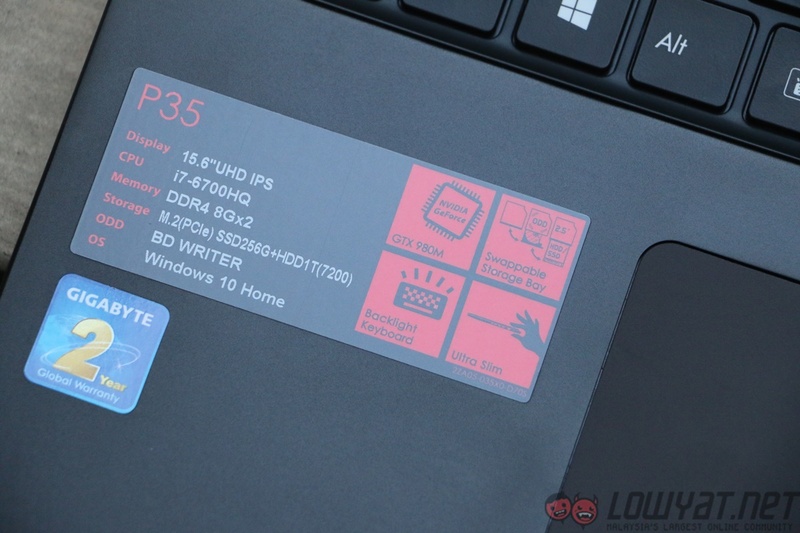 Finally, the P35X v5 – our review unit, at least – has some issues with manufacturing and software problems. For one, when plugging in a headphone or an earphone, I noticed a faint but noticeable buzzing sound, which may be caused by electrical interference between the on-board sound card and other electronics inside the P35X v5. Besides that, the P35X v5 crashed multiple times when running benchmarks using 3DMark. 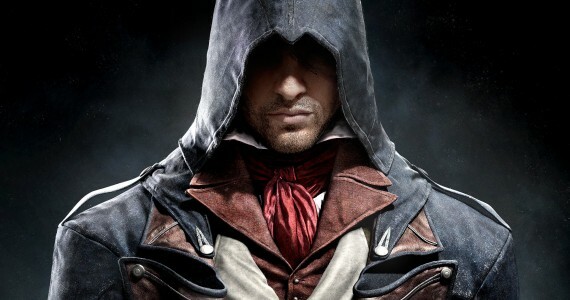 However, this issue did not occur when benchmarking games. 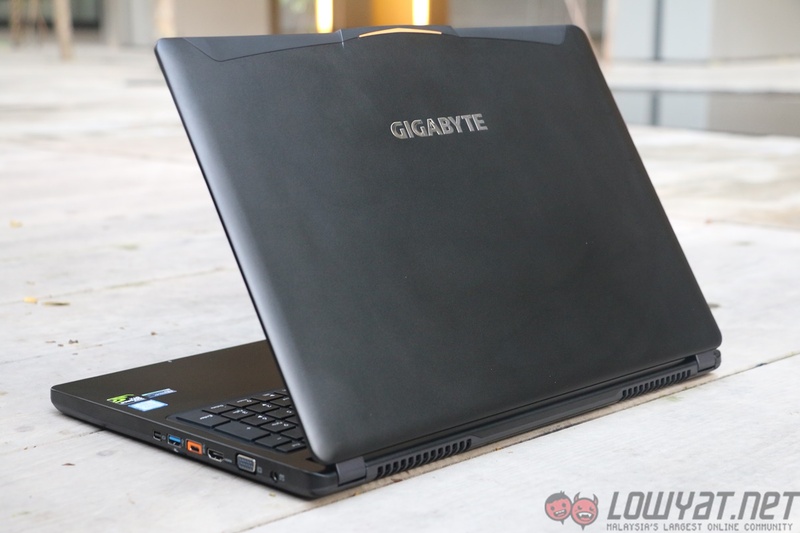 Finding a like-for-like competitor for the Gigabyte P35X v5 is not easy. 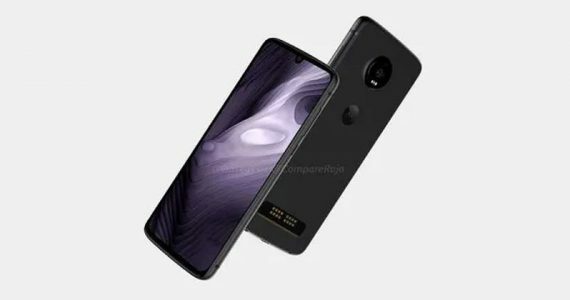 However, we can instead look for an alternative for the P35X v5 based on three factors: performance, form factor and display. Performance-wise, the GTX 980M that comes with the P35X v5 can be found in plenty of high-end gaming laptop nowadays. 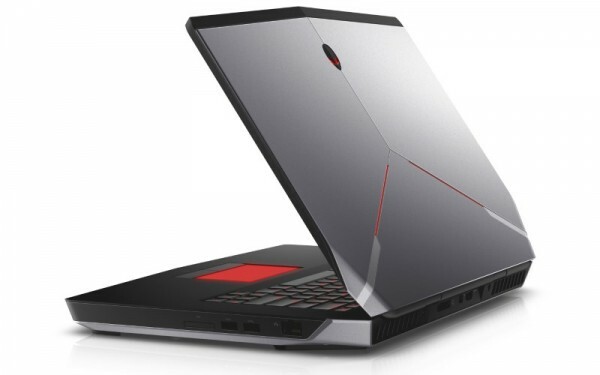 A good gaming laptop that fits this category would be the Alienware 15 R2. Priced at RM8,899, not only does the Alienware 15 R2 come with a GTX 980M, it can also be equipped with a 4K display – for an additional RM700. One thing that makes the P35X v5 more favourable compared to the Alienware would be the weight. 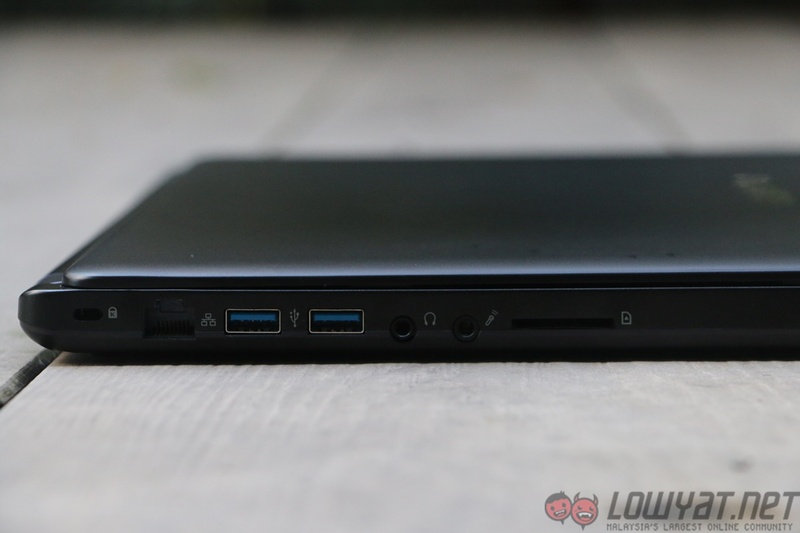 At 3.2Kg, the Alienware 15 R2 is significantly heavier compared to the 2.4Kg P35X v5. When it comes to form factor, there aren’t many slim 15-inch gaming laptop being manufactured these days. But, if price isn’t an issue, then the 14-inch QHD+ Razer Blade (2015) would be the best competitor to the P35X v5 in terms of mobility. 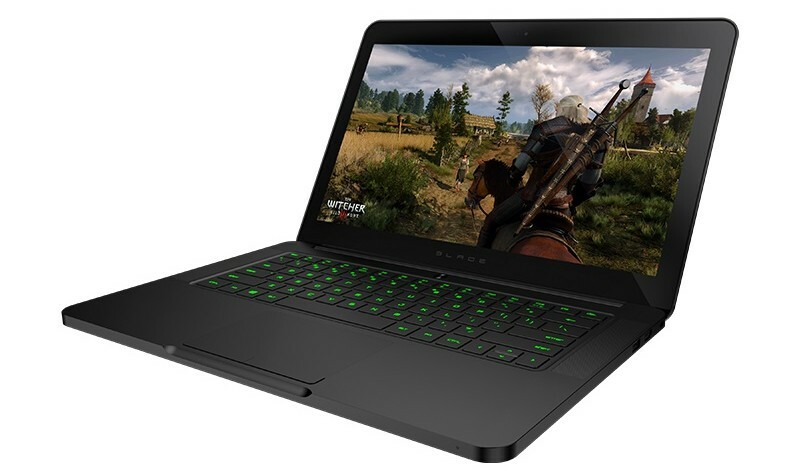 Arguably one of the slimmest gaming laptops around, the New Razer Blade is packed with a GTX 970M GPU, a QHD+ display and weighs merely 2.03Kg, making it a good, but pricier substitute to the P35X v5. 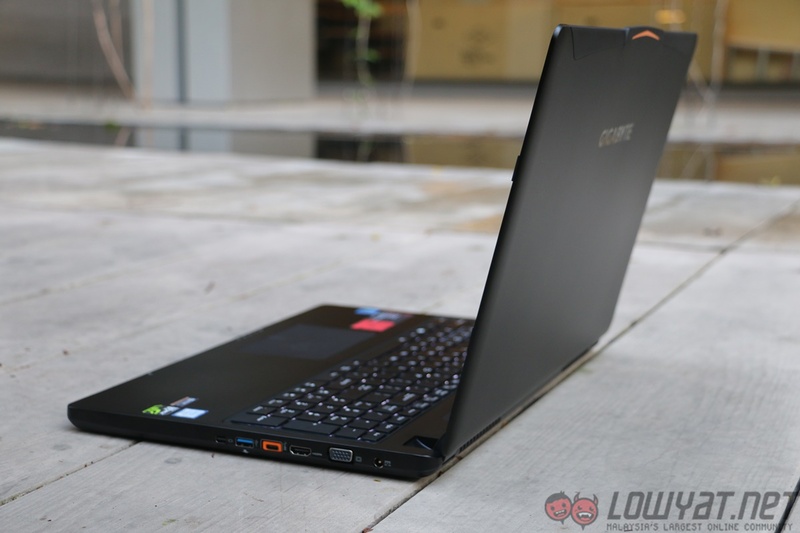 Actually, there is a very interesting alternative for the P35X v5 in terms of display: the Lenovo Y50-70 UHD gaming laptop. Though not as powerful as the P35X v5, the Lenovo Y50-70 does, however, boast a 4K IPS display just like the P35X v5 (though of a lesser quality). 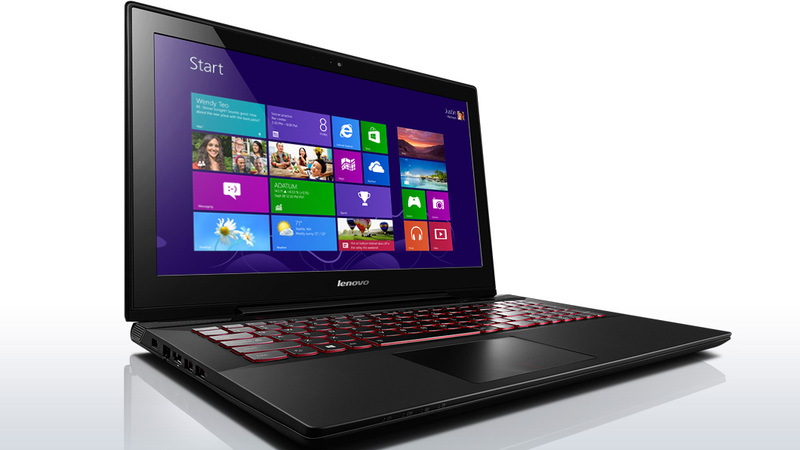 But, being equipped with a mid-range GTX 960M means smooth 4K gaming on the Lenovo Y50-70 is hardly achievable. 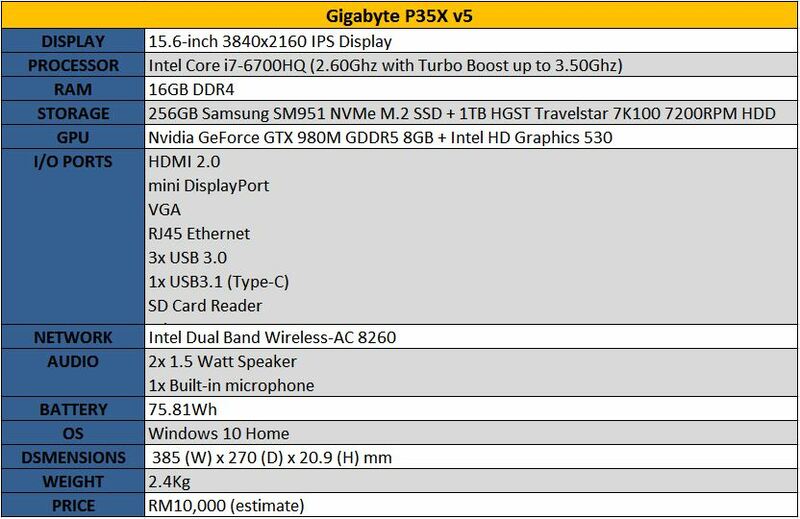 That said, not only does it weigh about the same as the P35X v5, it is also priced significantly cheaper – approximately RM3,700 less than the Gigabyte. 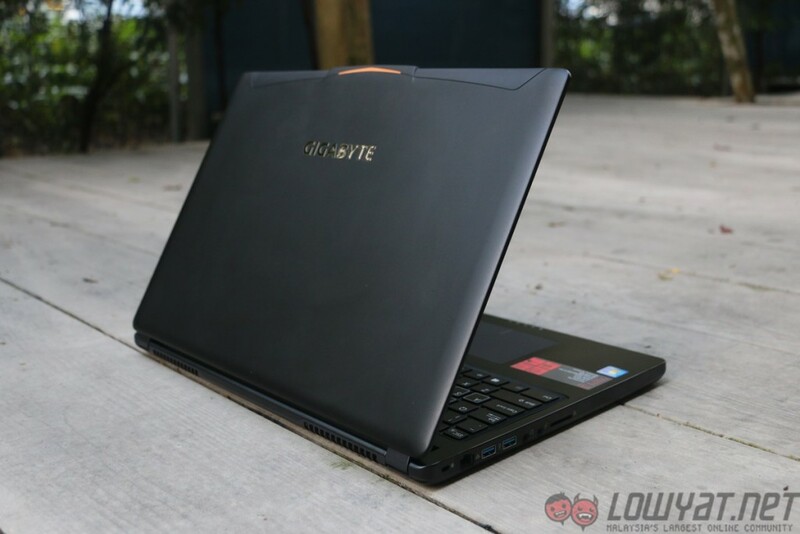 Gigabyte’s attempt at making a 4K gaming laptop with the P35X v5 is somewhat short of being perfect. If it wasn’t for the uncomfortable keyboard, slight hardware issues, and somewhat bland design choices, the P35X v5 would definitely be ranked arguably the best 15.6-inch gaming laptop in the market. However, where the P35X v5 excels at is at being what it is intended to be: a powerful, no frills premium gaming laptop. It barely broke a sweat at anything we threw its way, and every game we played on it on Full HD was flawless. 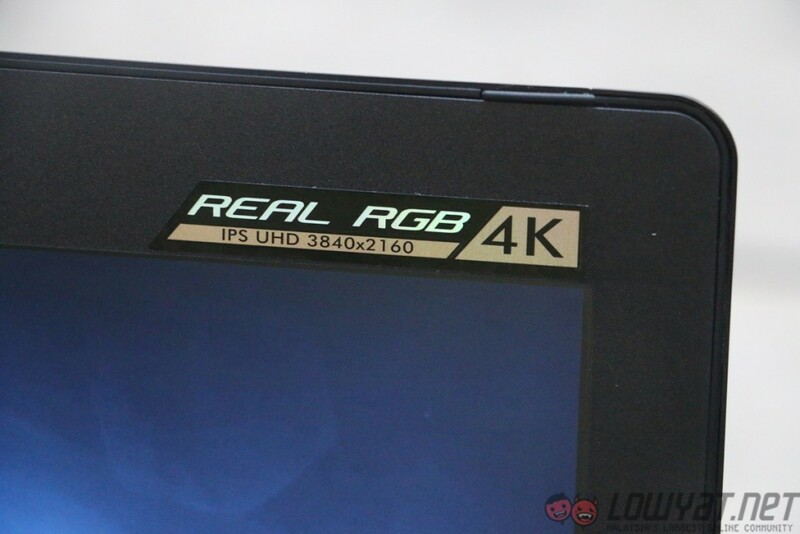 Unfortunately, the 4K variant of the P35X v5 will not be officially coming to Malaysia. That could be a blessing, as the Full HD variant – priced at RM8,999 in Malaysia – is arguably the better choice. When one puts into consideration the fact that it has pretty much the same hardware specifications, it’s pretty hard to turn down. 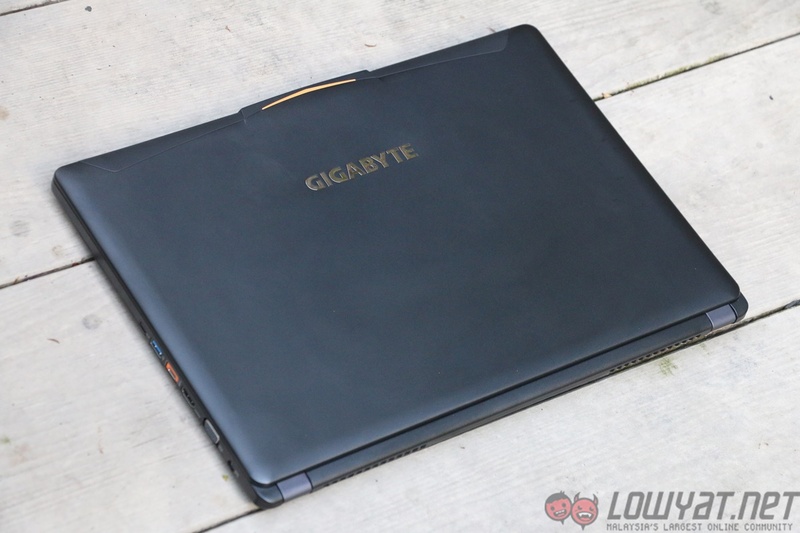 In all, Gigabyte has achieved quite a feat with the lightweight P35X v5 gaming laptop that is packed with powerful hardware along with a beautiful 4K IPS display. Hands down, this would be our choice of laptop…if money is not an issue.